Taking its name from Horatio Nelson, who was given the title of ‘Duke of Bronte’ by the King of Naples in 1799, Bronte is housed a gunfire shot from Nelson’s Column on the Strand. 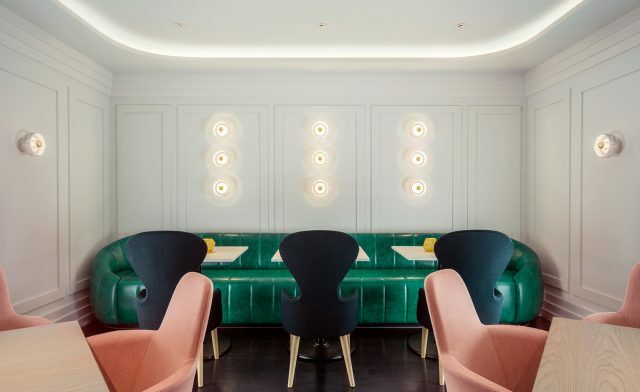 The restaurant has an Antipodean accent and inviting Tom Dixon interiors that include studio lighting, prawn pink seats and teal banquettes. Taking design cues from its Strand location, the site’s showstopper is an arched glazed façade leading from the colonnade terrace. We also love the pink concrete breakfast bar and gorgeous low-hung gold lights.